I participated in my second Foodie Pen Pal "swap" this month. I liked the event and trading so much from last month (see my post here) that I decided to participate again. So I signed up with Lyndsay at The Lean Green Bean blog to get another set of foodie pen pals. Much like last month, I learned a thing or two about my fellow food bloggers and foodie pen pal matches. The two people with whom I was matched this month were both young women, and both athletes. I supposed that my blog moniker and my mission statement lent itself to being matched with other athletic types. Too bad I'm not the athlete that I once was! The young woman I sent a package to is Shelby, who lives in Chicago. She's a student and an aspiring nutritionist, or as she calls herself, "An athlete trying to figure out how to best fuel her body…" I sent her a box of mostly local, unique and/or homemade items. Shelby eats healthy and isn't too into coffee or snacks. It wasn't too hard to find things that I thought she might like, so I decided to go with items I like and that worked before. I sent her John and Kira's famous mint chocolate bar - a local chocolate makers specializing in using only local or small batch ingredients. Their mint bars are famous and hard to come by since the mint they use comes from our local City Farm - Greens Grow. I also included Metropolitan Bakery's Coffee and Chocolate Granola; Steap Tea shop's Coconut Chai tea (w/some tea sachets); my favorite Korean Sesame Coconut Crackers - Gosomi Crackers; Justin's Almond Butter; two of my homemade salt free spice blends - Italian and Mexican; and to finish the package, a bit of honey that my friend, Ellen, got from her bees. Keeping most of this very local to the Pennsylvania/East Coast region! The package I received was from Becki who lives in Boston. She has a lovely blog, called Fighting for Wellness. The moment I received my matches this month, I went blog hunting to see if my pen pals each had a blog. Shelby doesn't, but Becki does, so I got the chance to read up on one of my pen pals. Again, similar to last month, except I received emails from both people immediately this time. Last month, the person to whom I was supposed to send a box to never responded. My match with Military Mike was done as a last minute scramble. I was quite happy to hear from both of my matches and to be able to "connect" with both women on several levels. Becki has a similar life turn-around story that I have, like so many of us have - we struggled for years with our weight, with eating issues (yes, I get the irony that we are exchanging foodie packages!) and that we both found our inner athletes a bit later than the average bear. Becki, gawd bless her, is a youngin' though. I think she's in her mid 20's, so she is a much more fortunate soul to have found fitness and wellness at a younger stage of her life. I admire her strength, openness and honesty about where she's come and her fight for wellness every day. It's one thing to have the life change "aha" moment in one's 40's - when wisdom is supposed to hit us. It's quite another to realize when you're still developing that making positive life and health changes can be achieved and realized in your 20's too. 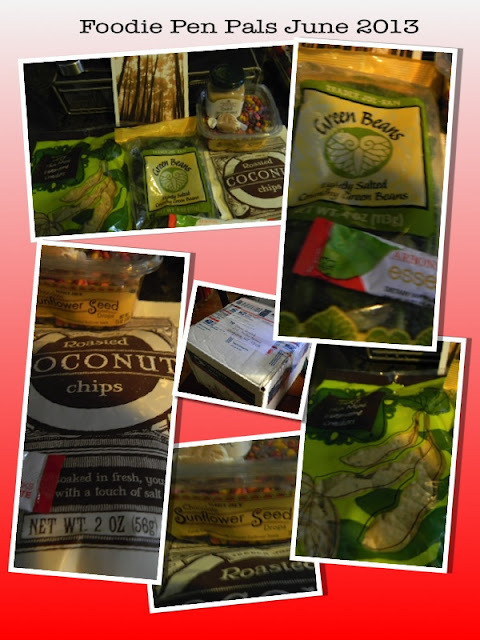 Becki sent me such great stuff, mostly from Trader Joe's. A few things I've seen before and have tried, a few things I've wanted to try, and a few things I never knew about! As my friend, Jen Check, would say, "I got some new food things that I never had before!" Inside my foodie box were my favorite, Toasted Coconut Chips. I also got to try chocolate covered sunflower seeds - which Nate loves loves loves! Freeze dried string bean snacks; Savory Mini Thin Edamame Crackers - a great alternative to chips or pretzels; Stonewall Kitchen Mustard and two samples from Arbonne, 'cause Miss Becki is an Arbonne sales specialist. I liked the ginger chew from Arbonne, but I wasn't crazy about the fizzy drink mix - I just can't drink any mixes that are either too sugary (I know, given my penchant for sweets) or anything with sugar substitutes. Over all, it was another great box of food finds. The whole family is enjoying the spoils of my trade! Too bad I can't participate in the July swap - with my vacations in July, it would be too difficult to try to gather good stuff for someone . I'll try to resume the pen pal game in August. In the meantime, if you want to try this - and I wholly encourage you to give this a try and to push past your comfort zone - check out Lyndsay's blog and sign up here to join. You have until the 3rd of each month to sign up. Matches will be sent via email on the 5th of the month. You write to the person to whom you are sending a box, getting details on who they are, dietary issues, food restrictions, likes, dislikes, etc. Then you send off a box of goodies, spending limit of $15, by the 15th of the month. A post and photos are then revealed at the end of the month, usually on the last Friday of the month. As I have written, it's been a great experience, to be able to write in real life with people from all over the country. I'm still writing with Karen G. who lives out in Oklahoma. I bet I'll continue to write to Becki and Shelby, perhaps even meeting all of them one day!